7.52 points at 23 votes (rank 196). Frankie has provided over 60 tasks for your travel from Mundanesville through the Pleasuredome. The task consists mainly of a lineup of simple and trivial activites to the brave heroic deeds, which need skill and intelligence. After each finished task, an evaluation table shows you the increase in the different elements of your personality and pleasure points are given. Your aim is to become a full person. To achieve this, you need to reach the summit of the evaluation table (when the word "BANG" alights above the personality factors) and 87.000 pleasure points. This combination enables you to look for the special door - the door to the greatest experience - the center of the Pleasuredome. You start your adventure without personality in a surrounding of suburban boredom. But do not let yourself be misled by the peace! There are different streets and houses. Touch everything, explore, experiment! Your curiosity will pay off. Collect items. Some of them will help you immediately and you will need others to survive in the Pleasuredome. The cat, e.g., drinks the milk. With rising familiarity with the Pleasuredome and its borders to the usual world, you learn the pattern of the game and you will be able to move from one element to the other without difficulties by using the Corridors of Power or other methods that you will discover. Remember, to complete your personality you need to finish all tasks, only then you get the possibility to search for the door behind which lies the secret to self-discovery! You will discover a body. Who is the murderer? Solve the puzzle systematically. Try to find the 23 solution keys that appear in the windows. Return to the crime scene when a window appears that shows all possible suspects. Point with the cursor finger on the murderer. You can move freely through this labyrinth inside the dome and it is connected to Mundanesville (other routes can also be discovered). It can be charted precisely due to the colours of the manhole covers that are spread along the path. Fire balls come out of the covers, if you hit them you can create new exits. 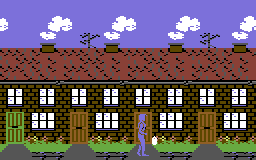 The entrances appear during the game. Learn how to use the corridors to your favour, as they will be very useful in the following elements and in it the door to the marrow of the Pleasuredome will appear (when both primary aims have been reached). 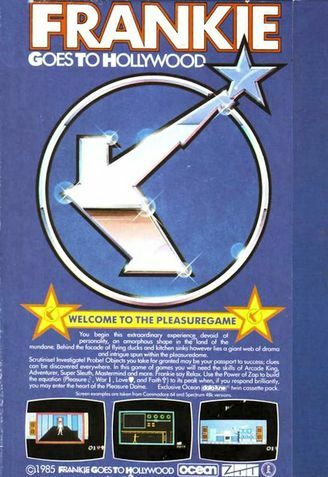 In the Pleasuredome a series of games and puzzles awaits you, which you have to finish to reach enough points and to form your personality. There are main entrances into this world of thoughts. These entrances and those which appear in the Corridors of Power, take you to the arcade elements. Avoid the destruction of Merseyside and the ship harbour by the bombers. You get a time limit to survive or defeat the enemy. Several hits are needed to shoot an airplane! Grab the halos, they can be useful later. But you can only move forward on the cloud. Avoid the arrows. Wander between space and time to get to the ground beneath you. Tip: There is more to it than it seems. This conversation between the rulers of the world can have bad consequences. A counter shows you how many (political) lives you have still left. Choose your politic by moving left or right. Shoot at popular personalities (100% hit rate to finish). If this gets a "duck shooting", you may have an additional free shot or you lose the chance for a victory. Destroy the wall to get to the control room and then solve the puzzle. But look to it that you avoid the bullets. TIP: Here you might need cover. TIP: What you carry can halve your pain or double your pleasure! In this task shoot at the symbols to get pleasure points (one game for each of the four symbols). Here you need to catch as many flowers (20) as possible. Here you need to insert your disks and finally use the security pass. TIP: If your inventory is not complete, you can use the lift to escape. In the right area of the screen the four personality bars are always shown. The rest of the screen (256x160 pixel) is used for the game. A special technique for displaying message windows was implemented. Numerous background tunes accompany the game. This is how you activate a game in the game! How do you reach 87000 points? Werner: "A very diversified game with detailled graphics. 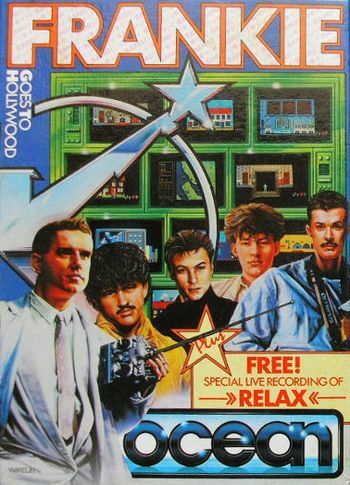 The better mini games are "Attack over Merseyside", "Arrows", "Talking Heads" and the shooting gallery. The other mini games are unfortunately only obligatory tasks. The murder puzzle can also be solved easily without much knowledge of the English language. 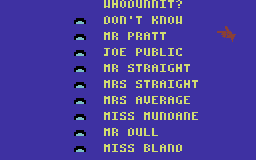 When you have found all the hints, just try all eight names in the list one after the other (leave the room and enter again). I thought the best were the numerous music pieces which fit the game well. As soon as you have understood the course of the game, it can be very motivating until you have played it through. For a bizarre game idea and the fact that the game does not reload (onefiler) I give 9 points." 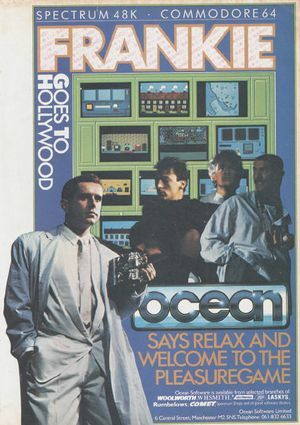 Robotron2084: "FGTH looks really great and sounds brilliant, technically it is really impressive what has been stuffed into it. But unfortunately the game suffers - I think - from the Lazy Jones-syndrome: many small and often petty mini games that at the worst have also to be played through several times. FGTH is creative, that is beyond question, but the fun runs dry rather fast after you have seen almost everything and then boredom soon spreads itself. It is boredom with high-finish polish, but still boredom. But to be honest, I am not that much into action adventures. 7 out of 10 points (bonus point for the music already included)." This page was last modified on 8 April 2016, at 04:14.